There is an interesting lawsuit out of Flint Township, Michigan over the arrest of John David McMorris who was arrested for a concealed weapon on Christmas Eve. 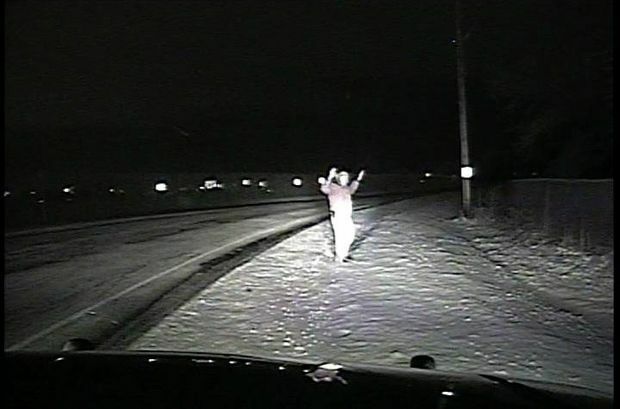 McMorris, 21, was walking alongside a road when he was stopped by a Flint Township police officer. The officer arrested him for concealing a handgun. It is legal to openly carry a handgun. However, the video below shows the gun clearly in the open and McMorris even turned with his hands up to show the officer his .40-caliber Smith & Wesson pistol on his hip. The officer tried to be McMorris a breathalyzer but his batteries appear to have died. The officer insisted that he could not see the gun (quite visible on the videotape) as he approached. The officer had passed McMorris 15 minutes earlier and flashed his brights. McMorris told the officer that he was not aware if the front of his coat was covering the gun, but that it was on his holster in plain view. The officer insisted that he did not see it and, because McMorris did not have a concealed weapons permit, he was under arrest. McMorris was taken to jail and missed his holiday celebration. He was later released without any charges. McMorris is asking for over $25,000 in actual and punitive damages for civil rights violations, false arrest and malicious prosecution. What makes this case so interesting is that the videotape evidence clearly contradicts the charge of the officer. However, as we have seen before, a baseless arrest (that incarcerated a citizen on Christmas Eve) did not result in any reported discipline of the officer or even an apology. A Wake Up Call For Good Morning America Or Just Another Fall From Grace? As others have stated, why did the cop turn around if he didn’t see the gun? Some people simply do not like guns, especially authoritarians, and they will use any and all resources to create fear and to argue same. The Second Amendment makes equal the citizen to the government official, for very sound historical reasons. This officer in all probability, does not like being equal to civilians, but rather likes feeling powerful over people, and unlawfully nipped it quickly by abusing that power, thus making himself unequal to the civilian. When the officer radios his location to dispatch he can be clearly heard saying the “subject” is armed. Then he lies about it to the man and arrests him. Paul – you are absolutely right the officer knows he is protected. The politicians allow this behavior because they love to spend money that’s not theirs and use these type of tactics to retain office. I was inquiring in your use of “liberal”. Wi Badgers in the Elite 8! Who says white men can’t jump or play hoops? Max, I don’t understand your question. Having questioned people for a living, a question must be succinct and unambiguous. Are we safe FROM the police, yet? Is “liberal” a dog whistle of partisanship or is it PC? you also couldn’t carry firearms in Big Whiskey. I’m not sure about English Bob’s emigration status either. Persons acting under color of state law can be sued under Title 42 Section 1983. Persons conspiring together and private persons conspiring with a state actor can be sued under Section 1985. Municipalities in most states can be named under the Monell Doctrine. Attorneys fees can be obtained under Section 1988 of the Act. States have sovereign immunity. Some states afford their municipalities sovereign immunity. Its the way the state and counties are set up. Punitive damages can be obtained against the individual defendants but not the municipalities. The cop here, his chief, and the town are up itShay creek if the plaintiff can get a good attorney. Jurors will relate to the Second Amendment arguments. Paul, In The People’s Republic of Madison the very liberal police arrested several men who were wearing side arms in a Culver’s fast food burger joint. They were minding their own biz, all good citizens w/ no records, eating burgers and malts. Well, a weasel woman called the police saying she “felt uncomfortable.” As we know, she would have equal or greater reason to feel uncomfortable w/ many cops carrying guns. So, the cops arrested all these[4 or 5] guys even though there was a long standing open carry law. The prosecutor backed off knowing this was an improper arrest and that a civil suit was probably coming. Ideologues only like some of the Constitution, I love ALL of it. This is flint twp, mi….. Genesee county…. They would have figured out a reason to arrest him….. Regardless of color of skin…. The officer was probably upset that he had to work…. Second Amendment haters gotta hate. 💡 Maybe he could’ve put a reflecter thingie on the holster. Now, if he wasn’t carrying a gun, none of this would have happened! Fun times in the OK Corral, a gun in every holster, yee ha, show yer guns. annie – could not be more correct about the OK Corral analogy. The Earps and Doc Holliday were going to disarm the Clantons. Things went bad. In this case the Earps (police officer) did not have to draw down on the Clantons (but took his legal pistol). In Tombstone it was illegal to carry a pistol or rifle in the city limits. Here, in this case, the state has an open carry law, so it appears that our putative Clanton was operating legally. I used to tell my students that if they wanted to drive the police crazy all they had to do was walk down the street with a rifle in their hands. Mine is also an open carry state. The police don’t like what you are doing, but it is still legal. Since you are acting within the law, even stopping you is harassment. You can make Xmas money (after paying your attorney and costs) from being illegally arrested in these situations. I still have a hard time figuring out why the cop circled back to stop him. He was doing everything legally, but what can the cop articulate to say he had a reasonable cause to stop him? What made him suspicious of this man? Dull night? Dunk’n Donuts is closed? Cases like this are why I bothered to get my WA CPL. A gun on the hip can be so very easily considered concealed by a shirt, coat, or shoulder bag.